Although most people are familiar with the way blood circulates in the body, few are aware of the existence of another equally vital system of circulation – The lymphatic system. After the skin, which is one of the body’s physical barriers to infections, part of the first line of defence, the lymphatic system plays a vital role in the other lines of defence, called the immune response. It includes the spleen, tonsils, thymus, lymph nodes,lymph vessels, other lymphoid tissues, and the clear, slightly sticky fluid called lymph. This fluid is the means by which the lymphatic system picks up cell wastes, proteins, excess fluid, toxins, viruses and bacteria from the spaces between the cells so that they can then be filtered, cleaned and excreted. In the circulatory system, blood flows from the heart, through the arteries, and into capillaries that surround all cells. When blood reaches the capillaries, a portion of blood plasma, the liquid portion of the blood, seeps out of the capillaries and into the space surrounding cells. That plasma is then known as tissue fluid. Tissue fluid consists of water plus dissolved molecules that are small enough to fit through the small openings in capillaries. 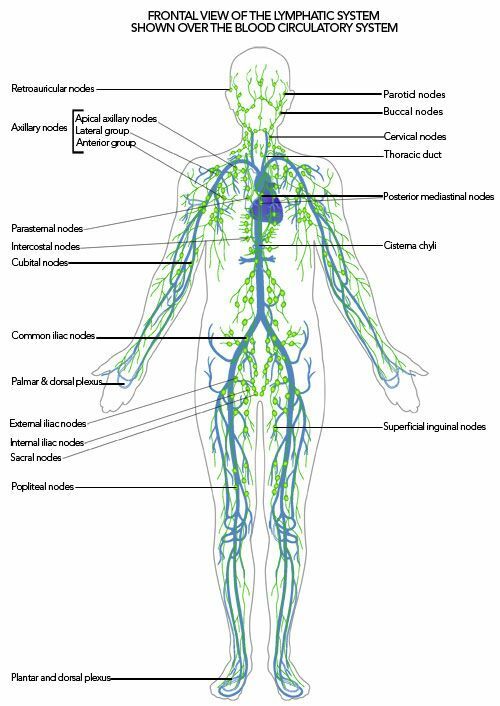 Like the roots of a tree, the lymphatic system starts as a network of tiny, delicate lymph vessels, lying just under the surface of the skin. These vessels are sometimes only one cell thick, and eventually branch into larger and larger vessels (tubes) that help the lymph carry excess fluid and waste products back to the blood stream by way of oneway valves. 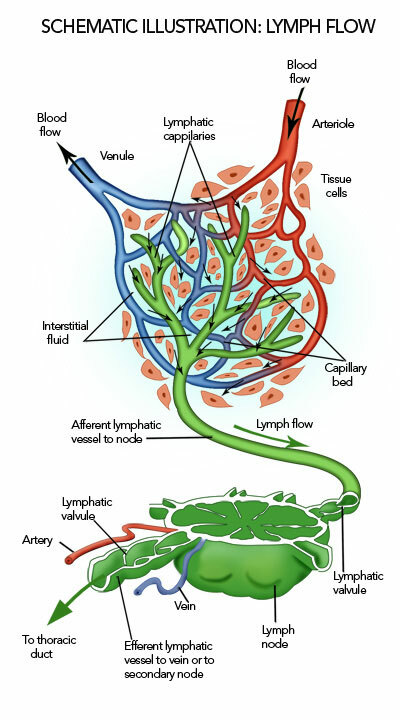 Along the path of this flow, the network of lymph vessels passes through collections of lymph nodes at certain points in the body. We commonly speak of these as nodes as “glands”. The nodes act like defence check points. Their function is to filter the lymph fluid and serve as the home for white blood cells, such as lymphocytes and macrophages, (which are little Pac Man-like cells) that attack and destroy foreign bacteria and viruses and abnormal cells, like cancer cells. Lymph nodes are found throughout the body, but can be felt most easily in the neck, armpits, groin and behind the knees, where they are more superficial. The majority of lymph nodes are found in the head/neck and abdominal regions.Lymph nodes vary in size; some are as small as a pinhead and others are about the size of a baked bean. There are about 600-700 lymph nodes in the body, but this varies from person to person. Different parts of the body also have different numbers of nodes; in the armpit, for example, there are about 15-30 small nodes. Sometimes the lymph nodes trap bacteria or viruses that they can’t destroy immediately. The lymph node will then usually swell and become tender and sore to touch. This is usually the sign of an infection which may need treatment with antibiotics. But where does all the lymph, which has been filtered in these nodes, finally end up, to be excreted from the body? The lymphatic system is thus vitally important both for the circulation of fluids in our bodies, but also as part of our immune system. Antibodies, which help us fight infections, are circulated in the lymphatic system, too. Lymphatic flow can stagnate for many reasons — such as swelling, chronic inflammation, lack of physical activity, stress, fatigue, emotional shock, age, surgery and pregnancy — or can be blocked due to, for example, scar-tissue, tight clothing, or certain more serious medical reasons such as tumours. When lymphatic circulation slows down, not only do waste products and proteins accumulate round the cells, but the regeneration of cells becomes less effective, as their supply of oxygen decreases. This then impacts negatively on the growth of new, healthy tissue. When the lymph system works well, we feel healthy and have a strong defence against illness. When it’s sluggish or blocked — say after surgery or an injury — we can have swelling, feel tired, and be more susceptible to colds and infections. Breathing : the movement of the diaphragm as we breathe helps our lymphatic circulation. Breathing correctly and deeply from the abdomen, rather than from the chest, helps the lymphatic fluid to move. Muscle movement: through exercise. The more you move, the more you stimulate your lymphatic system. Getting your heart-rate up: again through exercise — this improves blood flow, which has a “knock-on” effect on the lymph fluid. Peristalsis: A squeezing movement in the gastro-intestinal tract, which literally “milks” the lymph fluid in the intestines, as well as in the muscles of the larger, deeper lymph vessels. When our lymph is flowing normally, and is not overloaded with wastes, our health is maintained naturally, but if the lymph flow is sluggish, due to too much waste, blockages in the lymphatic network can occur, leading to a myriad of symptoms of illness. That is where Manual Lymph Drainage comes to the rescue. Manual Lymph Drainage uses specific techniques to accelerate lymphatic drainage along its natural pathways. These techniques stimulate the natural peristaltic contractions of the two to three layers of muscles located along these pathways, thereby encouraging stagnating fluid, toxins and wastes to move. Thus lymph is filtered more quickly through the nodes, and antibodies, lymphocytes, and other infectionfighting cells move through the body at a faster rate. As a result of this, our immunity is boosted, and we get rid of waste products and excess fluid more quickly. The venous system carries molecules the size of a pinhead – a molecular weight of less than 200. The lymphatic system carries molecules the sizes of boulders – a molecular weight of 70, 000 to 130, 000 – and sometimes even mountains, since red blood cells would equate an entire mountain on the molecular scale!